This is the most diverse Congress ever. But it’s still pretty white. The current Congress is the most racially diverse in history, but it’s still much whiter than the country overall, according to a new analysis by the Pew Research Center. 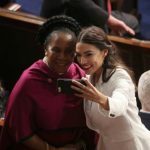 First, the good news: About 22 percent of members of the House and Senate, or 116 lawmakers, are racial or ethnic minorities — the most diverse Congress ever. “This represents an 84% increase over the 107th Congress of 2001-03, which had 63 minority members,” Kristen Bialik wrote for Pew. The current Congress is also the fifth in a row that has been more racially or ethnically diverse than the last. As this chart from Pew shows, the current Congress’s boost in diversity reflects an increase in every major racial and ethnic group — black, Hispanic, Asian, and Native American. The shifts are also lopsided by political party: Of the 22 nonwhite first-term representatives, only one is a Republican, Bialik wrote. Still, Congress remains pretty white overall compared to the rest of the US population. About 78 percent of Congress is white, versus 61 percent of the overall population. The overall gap has widened over time, according to Pew, which means the US population is becoming less white more quickly than Congress is becoming less white. One caveat: Some members of Congress are counted twice in Pew’s analysis. Presidential candidate and Sen. Kamala Harris (D-CA), for example, is black and South Asian, and counted in both categories. Beyond making Congress look a bit more like the people it’s supposed to represent, this kind of diversity matters because people’s backgrounds and life experiences can influence what issues they think are most important. These experiences have helped shape Scott’s views on policies regarding police and the criminal justice system, leading him to support — and introduce — certain reform efforts. The same applies to gender diversity and equality. Studies show, for example, that electing more women has a noticeable effect on how governments work, with research indicating that women legislators sponsor more bills, pass more laws, and get more money sent back to their districts. So the new Congress doesn’t just look a bit more like the people it represents now. It also may be somewhat more representative, in terms of concerns and policy, for the rest of the country.